CANTON, Mass. 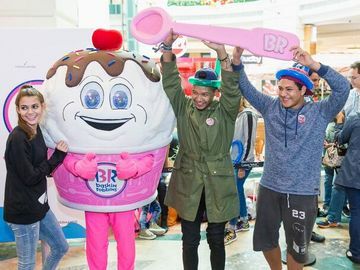 (August 24, 2015) – Baskin-Robbins, the world’s largest chain of ice cream specialty shops, today announced a special ice cream deal available for its August “Celebrate 31” promotion. On Monday, August 31st guests can enjoy $1.31 ice cream scoops at participating Baskin-Robbins shops nationwide. 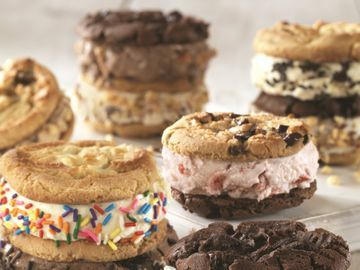 To help celebrate the brand’s 70th birthday and its “31 flavors” heritage throughout the year, Baskin-Robbins is offering sweet frozen treat deals on each 31st of the month through the end of the year. Guests can enjoy this special “Celebrate 31” deal on their favorite Baskin-Robbins ice cream flavors, including classics like Pralines ‘n Cream, Very Berry Strawberry, Rocky Road, Mint Chocolate Chip and World Class® Chocolate. Additionally, Baskin-Robbins is featuring a range of seasonal ice cream flavors available at participating shops this summer, which includes Chocolate Almond, OREO® ‘n Cake, Rum Raisin, S’More the Merrier and Wild ‘n Reckless. OREO® Cream Delight Cookie Cake: This elegant creation features a cream palette with a textured, combed side, complemented by a white dipping chocolate drizzled edge, OREO® cookies on top and a fudge border. This cake serves 12-16 people. OREO® Cream Delight Cookie Roll Cake: Featuring the same look and feel as the OREO® Cream Delight Cookie Cake, this roll cake is a smaller portion which serves 6-8 people.